St. Francis of Assisi (1182–1226) has been a source of inspiration for hundreds of thousands of people down through the centuries. During his own lifetime three religious Orders were founded, an order for men, one for women and a third Order for men and women, married and unmarried. Together with his friend St. Clare (1194–1253), Francis lay the foundations for the great Franciscan movement which over the centuries gave rise to a great variety of congregations and religious associations. 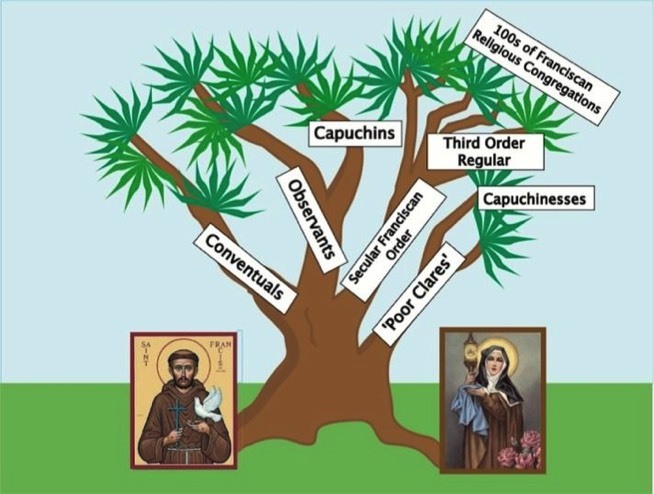 Some of them are posted on our "Family Tree" and for further information, please click on the pictures of St. Francis, St. Clare, or any of the labels. Clicking on the labels and on the pictures of St. Francis and St. Clare below will take you to other websites with further information.